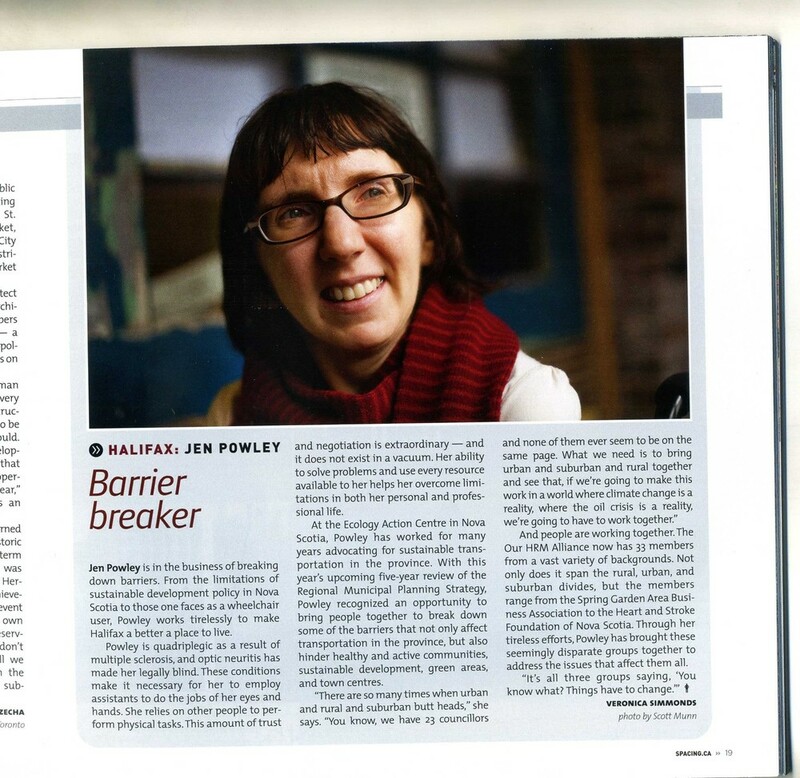 Jen Powley is in the business of breaking down barriers. She’s the kind of lady that instantly disarms you. She will make you laugh and then she will make you think and then she will challenge you to make your city a better place. An Alberta native, Jen moved to Nova Scotia in 1999 to do her Bachelors of Journalism degree. Then after working at the Nova Scotia League for Equal Opportunities and confronting issues of accessible housing Jen decided to do her Masters in Planning. Oh she’s working. Jen is always working. At the Ecology Action Centre Jen is the Sustainable Transportation Coordinator. In this role she has racked up a long list of achievements including implementing the U-Pass - a transit pass for the students of Halifax’s four universities and helping to create and distribute the Green Mobility Strategy - a toolkit of sustainable transportation options for Nova Scotian municipalities. With this year’s upcoming 5 year review of the Regional Municipal Planning Strategy Jen saw an opportunity to bring people to together to break down some of the barriers that not only effect transportation in the province, but that hinder healthy and active communities, sustainable development, green areas and town centres. And people are working together. The Our HRM Alliance now has 33 members from a variety of backgrounds. Spanning the rural, urban and suburban divides, members range from the Spring Garden Area Business Association to the Heart and Stroke Foundation of Nova Scotia. Jen has brought these seemingly disparate groups together. She made them laugh, she made them think and now they are working to make their city a better place.